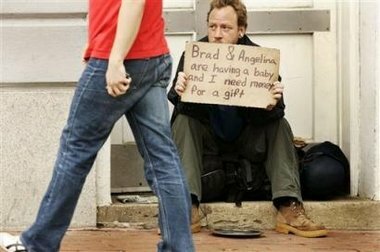 Humor Can Make You Homeless? I’d give his some money… would you? How does this apply to you? Glad you asked. This guy SURELY gets more money because of his funny sign then he would with a more typical “I’m down on my luck” sign. For him (I’m CERTAIN) humor works. It helps him reach his bottom line. Go get out there and take yourself — and your business — less seriously. And you’ll get more of what YOU want… you’ll improve your bottom line too. https://www.bradmontgomery.com/wp-content/uploads/2018/11/logo-1-495x198-1-300x120.png 0 0 admin https://www.bradmontgomery.com/wp-content/uploads/2018/11/logo-1-495x198-1-300x120.png admin2006-06-16 16:09:562006-06-16 16:09:56Humor Can Make You Homeless?